Sunglasses are no longer just an accessory; they are a universal symbol of style and urban coolness. 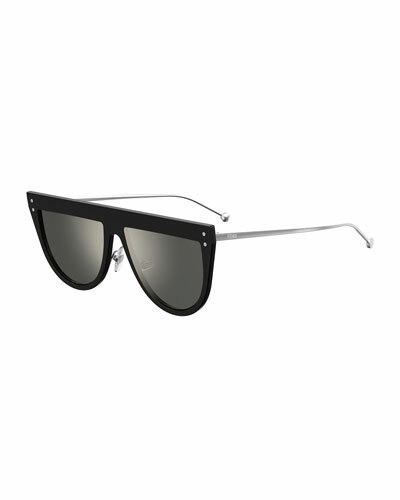 Neiman Marcus offers an amazing assortment of fashionable designer sunglasses. Our collection stands out for its unique details, array of frames, and trendy styles that turns everyday eyewear into a hot fashion accessory! This summer, step out in style in a pair of cool aviator sunglasses. If you are into classic cat-eye sunglasses, we have a variety of those in incredible colors. Choose from women’s rimless, semi-rimless, square sunglasses, and more at Neiman Marcus. Our selection is versatile and lets you choose by designer name, color, and more. Whether you are looking for the stylish buckle or cool oval shades, we have it all. Each pair of shades fits perfectly and is comfortable to wear. Shop Neiman Marcus’ collection of designer sunglasses in a variety of attractive designs and colors. Linda Farrow aviator sunglasses. Lens/bridge/temple (in mm): 60-16-140. Lightweight titanium with 18-karat, white gold plating. Mirrored aviator lenses. Open inset detail at frame front. Double nose bridge with doubled brow bar. Adjustable nose pads for added comfort. Slim temples with Japanese bulb tips. 100% UVA/UVB protection. Made in Japan. Linda Farrow semi-rimless aviator sunglasses. Lens/bridge/temple (in mm): 65-14-140. Titanium plated with 22kt yellow gold frames. 24kt yellow gold-coated vaporized Cridalon?? lenses. Double nose bridge; straight brow bar. Adjustable nose pads. Thin arms. 100% UVA/UVB protection. Made in Japan. Pared Eyewear "Camels & Caravans" aviator sunglasses in handmade acetate. Signature OBE rubber-dipped screws for durability and longevity. Square, monochromatic CR-39?? lenses. Double nose bridge; extended straight brow bar. Titanium arms with notched temples. Capped earpieces with "P" inlay at tips. 100% UVA/UVB protection. Imported.